Julian Darius Revie, composer in residence at St. Thomas More Chapel at Yale, has won the Vatican’s 2016 “Francesco Siciliani” prize for a sacred music composition. The object of the competition, open to candidates of any nationality, is to compose a piece for unaccompanied choir, or for choir with organ accompaniment, for a duration between five and fifteen minutes on a short chosen text with a special meaning. This year’s text was the Kyrie. In addition to winning the popular vote, Revie’s piece was one of two winners chosen by the judges from a pool of about 100 scores. The international competition is promoted jointly by the Fondazione Perugia Musica Classica Onlus, the Sagra Musicale Umbra Festival, and the Pontifical Council for Culture. This year’s head judges were Arvo Pärt and Helmuth Rilling. 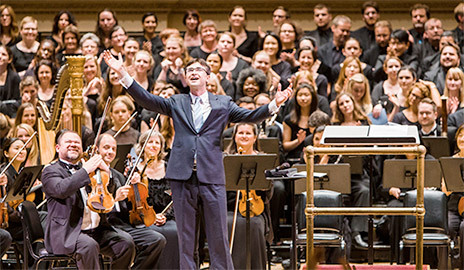 Revie’s prize-winning piece, “Kyrie,” received its North American premiere on Dec. 3 at St. Thomas More Chapel at Yale.